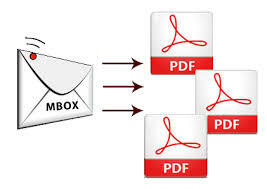 In this time, thousands of users are such who use MBOX files based mail clients as per their need and some of them are also having need to convert MBOX files to PDF with attachments after that they can easily print MBOX files to PDF as PDF extension is well-useful to print by the most of the printer. After converting MBOX to PDF, users can simply view exported PDF files with multiple devices such as Laptop, Android Mobile, MacBook, Tablet, Computer, etc. In this article, we are providing important facts, manual and alternative solution to know about how to convert MBOX files to PDF with exact data information. After exploring this article, you can simply shift your MBOX files to Adobe Reader PDF file format with exact information. To know about the manual & alternative conversion solution, get some facts about MBOX & PDF file extension. MBOX file is a mailbox extension for a text file which is used to generate & save mail messages. It means for MailBOX and it is also a common file format to save emails on your hard drive. Entire messages for each mailbox are saved as long, single text file in a string of concatenated mails, starting with “From” header of the message. It was used predominantly on UNIX. It is supported by multiple apps such as Mac Mail, Thunderbird, Spicebird, SeaMonkey, PocoMail, Postbox, The Bat, Mailbird, etc. PDF is a file extension that has imprisoned entire elements of a printed document as an electronic image that you can easily read, view, print or forward to someone else. It is a universal file format and easily acceptable for professional, governmental and personal uses. It can be easily operated by anyone. It also provides multiple advance functions such as safety & security. To view & use the files, you need the free Adobe Reader which can be easily downloaded. To convert MBOX files into PDF, there is no direct conversion option available because both file formats are absolutely different but a manual trick can solve this issue. So if you are searching for manual trick then follow the given step by step process. Collect all MBOX files at a place and install Thunderbird. Now copy all .mbox files and paste at this Thunderbird message stored location. Now go to Tools >> Import/Export Tools >> Export all messages in the folder >> PDF format. To overcome from the situation of MBOX to PDF Conversion issue, you can go with MBOX to PDF Converter app that is available with some extra ordinary options which provides advance & perfect migration processing to achieve instant & exact outcome for MBOX to PDF. The program supports simple working procedure which can be handled by anyone. Still you have any doubt and would like to get a free demo then you can go with its free download facility that is eligible to convert 25 emails from MBOX files to PDF absolutely free. It also supports all MBOX files based application - Mac Mail, Thunderbird, Spicebird, SeaMonkey, PocoMail, Postbox, The Bat, Mailbird, even it can easily convert orphan MBOX files into PDF with attachments. The most attractive function of this app is that it supports attachment save as PDF option to save attachments into PDF file format.